An Application Programming Interface (API) is simply a set protocols and tools for building software. APIs make it easy to develop custom integrations by supplying the building blocks that programmers need. nVent NUHEAT has developed an open API for the Signature thermostat, making it easier for developers and integrators to create custom home automation systems featuring nVent NUHEAT Floor Heating Systems. Developers and integrators can access API documentation for the Signature thermostat to develop custom integrations with home automation systems or other connected devices at https://developers.nuheat.com. 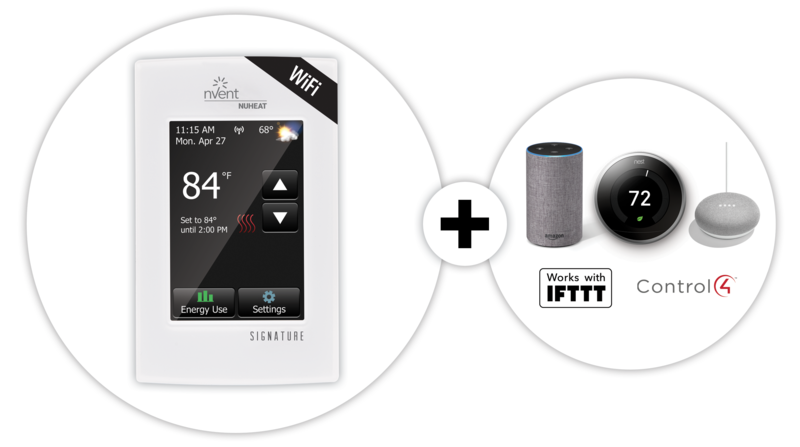 The nVent NUHEAT API tools have been used to develop the integrations between our Signature thermostat and the Google Assistant®, Amazon Alexa®, IFTTT®, and more! nVent NUHEAT Signature is Floor Heating for the Connected Home!